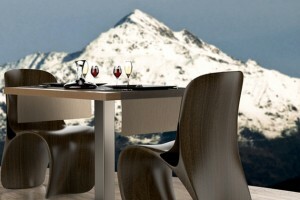 Take a break from the ordinary and over rated French ski resorts when you check into the Savoie Tarentaise. This resort offers a different experience from that of the other nearby major resorts such as Tinges and offers a charm all of her own. This area are resort rate high with skiers who are looking for natural trails that follow the topography of the mountain as opposed to a plowed and created run. Visitors here also rave about the authentic small mountain village feel of the surroundings. The trade off for the authentic experience and excellent views however are fewer activities at the resorts when the sun sets. The very attractive pricing however more than makes up for the lack of post ski hour activities. The area appeals to experienced skiers more than it does to those just getting started. The ski able area is composed of 15 slopes broken down by experience level as follows: 1 green slope, 3 blue slopes, 8 red slopes, and an impressive 3 black slopes. There are ski schools available to help you advance from a lower level slope to one of the more difficult slopes during your stay if you’d like to enroll. The classes are small and fill up quickly so you are encouraged to make reservations early. After hours the resort can boast a few activities including dinner at a restaurant, massage and spa treatments, a casino and an indoor heated swimming pool. You will also find an extensive children’s program to keep the kids occupied and entertained while you tackle the more difficult runs. There are children’s runs, childcare and indoor activities geared towards children as well. In fact, the area is known for being welcoming to skiers of many different classifications including children, senior citizens, and youth. Many resorts in this area will offer discounted rates to those groups.